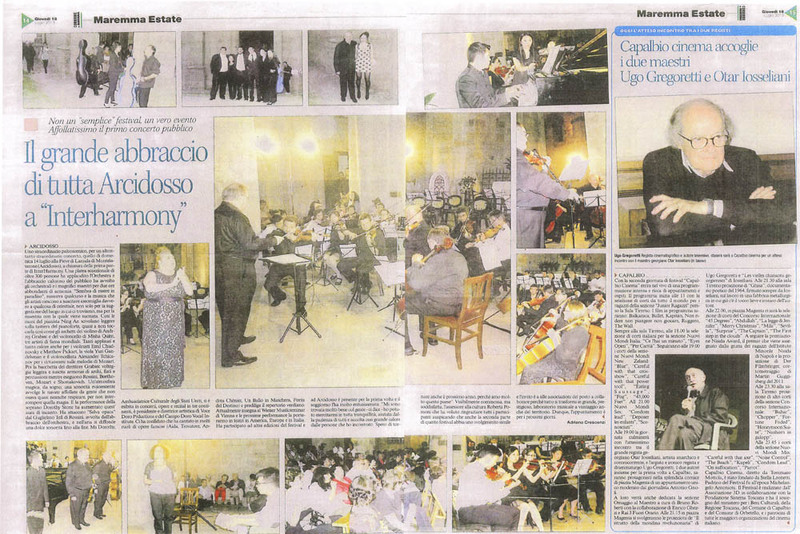 Agreat stage for an even greater concert, the one that was performed on Sunday, July 14 at Pieve di Lamula di Montelaterone to close the first part of the InterHarmony. An exceptional audience of 300 people who applauded the orchestra and the warming embrace of the audience who enveloped the musician and the magnificent maestros for more than two hours of harmony. "It seems to be in heaven" somebody whispers and the music that the artists can evoke resembles indeed something celestial, not only for the striking ambience, but also for the mastery in performing it. So, the hands of the pianist Ning An lightly slide over the piano keys, almost not touching them, just like the bow of the violin of Andrej Grabiec and that of the cello of Misha Quint, three renowned artists from all over the world. Much applause and enthusiasm for the violinists Emil Chudnovsky and Matthew Pickart, the violist Yuri Gandelsman and the cellist Alexander Tichanov, for their virtuosity in Mozart's melodies. Then the baton of the Maestro Grabiec lightly spins and evokes harmonies strings, winds and percussion, while they play Rossini, Beethoven, Mozart, and Shostakovich. A magical atmosphere, like a dream, an evanescent sonority that envelops the aisles crowded with people who didn't even dare to breathe for fear of interrupting that magic. And the performance of the soprano Dorothy Stone raised this aura of enchantment. She started "Selva opaca" from "William Tell" by Rossini, embraced by the orchestra and in the air the sweet sonority was sustained until the end. Ms. Stone, Cultural Ambassador of the United States, performed in concerts, operas and recitals in three continents and is the director of Voce Doro Productions and o thef Voce Doro Vocal Institute. She told us that she has played many roles in famous operas ("Aida", "Il Trovatore", "Andrea Chenier", "Un ballo in Maschera", Forza del Destino), and prefers a repertoire from Verdi. Presently, she teaches at Wiener Musikseminar of Vienna and the next performances will take her to theaters in America and Europe, such as in Italy. She took part to other seasons of the festival but she came to Italy for the first time and this town really excited her. 'I really got along very well with all the people' - she says – 'I could do rehearsals with serenity. Everybody was patience, and I was welcomed with a lot of warmth of the people I met. I hope to come back the next year as well because I really love this town'. Visibly moved, but satisfied, the chairwoman of the cultural committee, Roberta Pomoni, who wanted to thank all the participants to the festival, hoping that the second session of this festival will have a similar development. She invited all the local associations to collaborate in order to make this a larger, even more prestigious musical workshop for the benefit of the district. Hence, the event will continue and be grander in the future.